Port Elizabeth - A year ago, Jacques Potgieter had made plans to watch this weekend’s Test match between the Springboks and England with some of his mates. Potgieter watched from the stands as South Africa beat New Zealand 18-5 at the Nelson Mandela Bay Stadium last year. Instead, he will now run out in the green and gold national colours at the same venue for his debut in his hometown on Saturday. "It has been a big roller coaster ride," said Potgieter on Wednesday, having been named in Springbok coach Heyneke Meyer's starting XV for the third and final Test against the English Roses. The flanker has made massive strides in local rugby moving from the Currie Cup first division in 2011 to playing for the Bulls in Super Rugby this year. "I was still playing first division rugby (for the EP Kings) last year, and I was sitting in the stands and my friends said 'we should go and watch every game of the Boks'," an excited Potgieter said. "We said 'next year we should come and watch a game together'." Potgieter has just returned after five weeks on the sidelines because of a knee injury. He stood out in this year's Super Rugby season for the Bulls as a rugged ball-carrying flanker - making him the perfect replacement for the injured Willem Alberts. Playing in last year's Nations Cup as part of the SA Kings spurred him on to greater things. "It was just an amazing feeling when we played in the Nations Cup for Eastern Province in Romania," said the 26-year-old. "The first time I sang the national anthem for the country I said 'I can't wait to play for the Boks'. "Obviously, it was only a dream then but this year I am here." Potgieter conceded that replacing Alberts, who has been one of the greatest weapons for South Africa with his strong ball carrying ability and bone-crunching defence, would be a challenge. "I think Willem had an amazing two games, he is an amazing player," he said. "It is going to be big boots to fill because he just bashed those England 'okes' very hard." 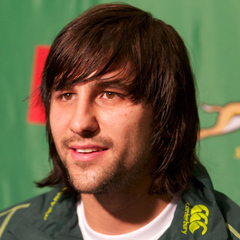 While the two players are similar in style of play, Potgieter felt he would bring something different to the team. "We have the same roles on the field and it won’t be easy but I am looking forward to the challenge," said Potgieter. The one similarity between Potgieter and Alberts is that they seem to lack any kind of fear of running into opposing players at full speed. "I always throw myself in front of anyone in front of me, I mean, that is the way I play," said Potgieter. "I just see it as a challenge to be as effective as he (Alberts) was. "He always got us over the advantage line to give our backs ball to play and that is what I will also try to do."